Career Nurturer answers queries of students and parents on various career topics. Farzad Minoo Damania (Career Counsellor and Psychotherapist at Career Nurturer) answers career queries in Parsi Times Newspaper dated 19th April 2014. There are various career tracks available for pursuing a career in forensic sciences. To be a forensic scientist then you may pursue B.Sc. in Forensic Sciences or Biological or Physical Sciences and then pursue M.Sc. in Forensic Sciences. You can get into forensic pathology, by pursuing M.B.B.S. and then M.D. in Forensic Medicine. If you want to get into criminology, then after graduation in science or arts, pursue M.A. or M.Sc. in Criminology. Being confused about career stream selection after 10th or 12th is perfectly okay. Instead of blindly selecting a career stream by following herd mentality, you should consult a career counsellor who can assist you and your daughter in making the right career decision. The career counsellor will conduct aptitude and psychometric assessments to analyse your daughter’s aptitude, interests, intelligence and personality; and thus facilitate in deciding the career that is best suitable for her. It will depend on the university you are applying to. Most of the universities conduct post graduation degree courses such as M.Tech. in English language. However a basic knowledge of German language will be helpful for better communication with the locals; and if you are looking for employment opportunities after your degree, then it will be advantageous if you know the language. Most universities offer German language courses for beginners. You can apply for Clerical and Probationary Officer jobs in banks. The criterion is that you should be a graduate (from any field) and within age group of 20 years to 28 years. For government banks there is a centralized application process via Institute of Banking Personnel Selection (IBPS). You have to register with them and pass their entrance exam for clerical grade or probationary officer grade. Those who are score above the exam result cut-off are called for personal interview. Private banks also follow a similar process of entrance exams and interviews independently. Farzad Minoo Damania (Career Nurturer) offers career counselling sessions and conducts psychological and aptitude tests for students to understand their aptitude, interests, personality, motivation, intelligence and abilities towards deciding their right career path. Counselling services are offered at convenience of your HOME in Mumbai, Thane and Navi Mumbai regions. Career Nurturer presented a career guidance seminar for students of Dharavi, Mumbai on Career Options after 10th and 12th. The seminar was presented by Farzad Minoo Damania (Career Counsellor, Psychotherapist and Founder of Career Nurturer) on 30th March 2014 at Dharavi. 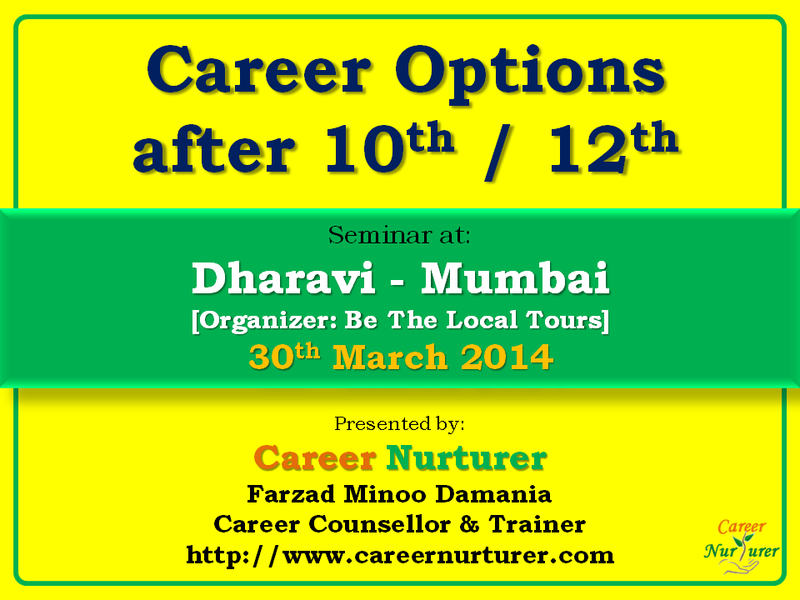 Here are few snapshots from the Career Guidance event at Dharavi, Mumbai on 30th March 2014, presented by Farzad Minoo Damania (Career Nurturer). 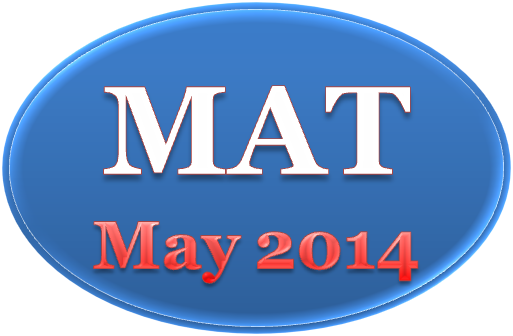 Management Aptitude Test (MAT) is an entrance exam conducted by AIMA for admission to MBA / PGDM courses across the country. The test is conducted in paper based and computer based formats. Are you looking for pursuing your MBA or PG Diploma in Management? But unsure which specialization to select? There are over 30+ specialization options for MBA. Marketing, Finance, Operations, HR, Event Mgmt, Public Relations, Information Tech, Media, Advertising, Hospitality, Hotel, Import and Export... and many more..
Career Nurturer conducts aptitude and psychometric assessments to help you understand your passion, abilities and personality; and accordingly helps you select the right specialization for MBA. Students aspiring to pursue B.Sc. 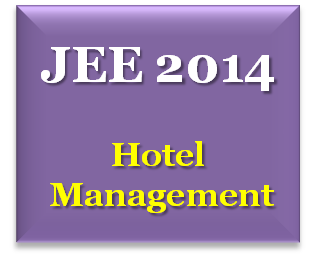 Hospitality & Hotel Administration 2014-15 have to appear for the entrance exam conducted by NCHMCT. Exams for 12th standard students are coming to an end. However, if you are confused about what career to pursue after 12th, please contact Farzad Minoo Damania (Career Counsellor and Psychotherapist at Career Nurturer) on 9833971773 and schedule your appointment for aptitude and psychometric assessments and career counselling session. Career Nurturer provides counselling services in Mumbai, Thane and Navi Mumbai areas. So call Career Nurturer today!